I just stumbled upon this and I really loved it, I didn’t know about Coca Cola being concerned about polar bears that much, so I really enjoyed what they did, regarding this issue. The Arctic Home campaign, supporting the World Wildlife Federation’s efforts to conserve the polar bear’s Arctic habitat, is Coca-Cola N.A.’s most ambitious holiday program to date. It consists of extensive integrated marketing efforts surrounding Coca-Cola’s major investment in distributing 1.4 billion special, white Coke cans featuring the Coke polar bears in the U.S. and Canada between this fall and March 2012. To extend their campaign they decided to partnership with 7-Eleven. Partnership Enhances The Coca-Cola Company’s “Arctic Home” Campaign, Supporting World Wildlife Fund to Conserve Polar Bear Habitat. Coca-Cola has been supporting WWF’s polar-bear-arctic-habitat conservation efforts for four years, according to the company. 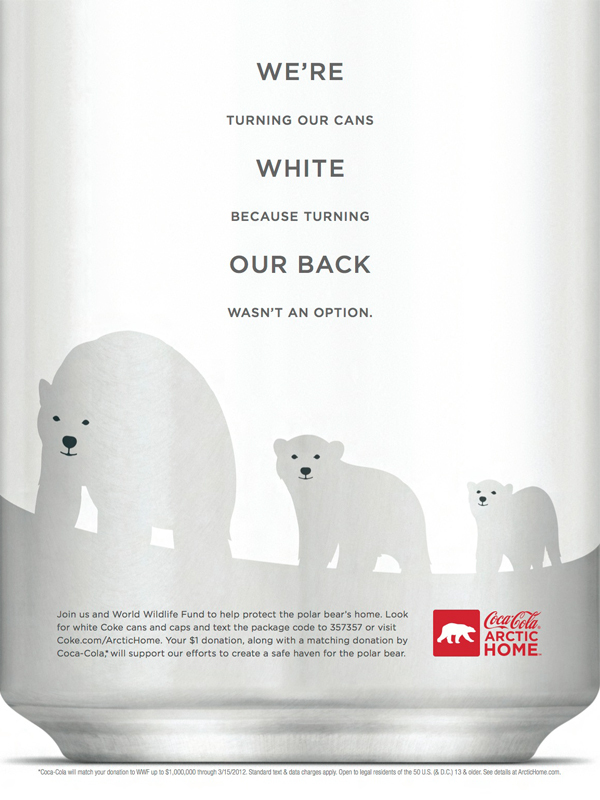 Its Arctic Home campaign — which also includes white caps on bottles of Coke, Diet Coke, Coke Zero, Sprite, Nestea, Minute Maid and other C-C beverage brands — commits the company to contributing up to $3 million to the cause. WWF has a vision to help protect the polar bear’s Arctic home. This includes working with local residents to manage an area high in the Arctic where the summer sea ice will likely persist the longest. This area — potentially covering 500,000 square miles — could provide a home for the polar bear while protecting the cultural and economic needs of local people. Coca-Cola and WWF also have partnered with Academy Award ® nominated filmmakers MacGillivray Freeman Films, which is working with Warner Bros. Pictures and IMAX Corporation to co-produce the new IMAX ® film To The Arctic 3D, scheduled for release in 2012 . Coca-Cola’s “Arctic Home” television commercials and content on the website, ArcticHome.com, feature sneak preview footage from the film. And here are some of the videos from Coca Cola and their lovable inspirational bears=) Enjoy!